Crystal lost over 50 pounds and never felt better. "I feel healthier and have so much more energy. Now I love the way my clothes fit and how I look" - Crystal C.
Almased is a low-glycemic high-protein meal replacement and dietary supplement. This unique multi-protein formula is created from different sources to fit the amino acid profile the human body needs for optimal function as exactly as possible. The bioavailability of amino acids and bioactive peptides (such as lunasin) is increased by a special process using active enzymes from natural sources. This makes the Almased Weight Loss PhenomenonTM possible! A well-functioning metabolism is not only important for weight loss but also for overall health. Many diseases occur because the metabolism does not function properly. Unhealthy eating habits are one of the main causes of a slower metabolism – usually, salt, sugar and fat intake are too high. However, the quality of our food is another problem: Industrial production, flavor enhancers, and preservatives destroy important nutrients, amino acids, and enzymes. As a result, a large number of people have an extremely slow metabolism. The body burns fewer calories which can lead to obesity, lack of energy and other complications. Almased helps your metabolism to function at its optimal level. This not only leads to weight loss, but it also avoids the dreaded yo-yo effect. Since the metabolism doesn’t slow down during the Almased Diet, you can prevent regaining the lost weight once you eat regularly again. 5 Ways Almased Helped Crystal Lose 52 lbs and love the way she looks. Almased boosts the metabolism and energy levels, without any stimulants. Keeping the metabolism active during a reduced-calorie high-protein diet will not only help you lose weight easily but equally important, it will help to sustain your results once the diet is over and you increase your calorie intake again. Since your metabolism doesn’t slow down during the Almased Diet, the body takes the energy it needs from fat instead of muscle. The benefits of high protein in Almased (27g per average serving size) is that it helps to further protect your muscle mass. You lose the weight that really matters. Since weight loss with Almased is fat loss, you will not only see the number on the scale go down but also your inches - a true body transformation. Almased’s high-quality protein not only helps to retain muscle, but it also keeps you full for 4-6 hours. Additionally, Almased has a very low glycemic index of 27. A low glycemic index helps to support a healthy blood sugar level. This helps to keep hunger and cravings at bay, and further improves the fat burning process. 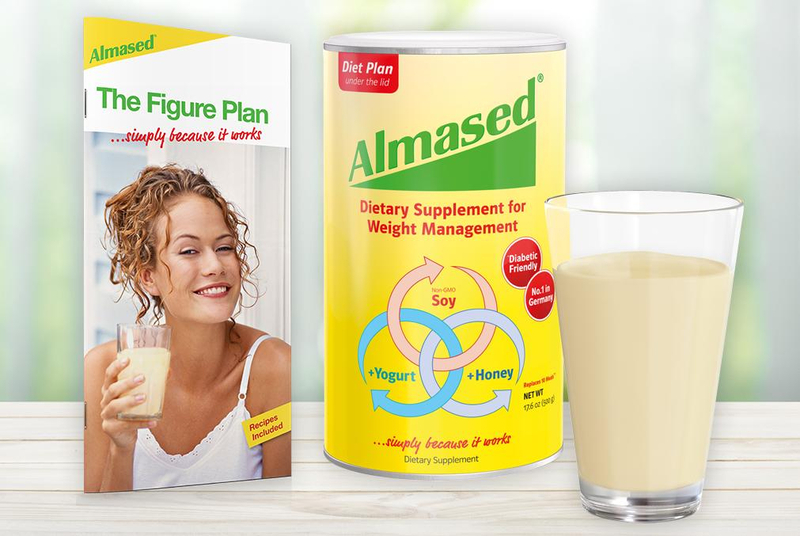 "Lose the Weight That Matters"
Almased is used along with the Almased Figure Plan, a simple meal replacement plan that is divided into four easy weight loss phases. The first phase kicks you off on an all-liquid fast to help boost the Almased. You drink Almased three shakes a day for three days up to 14 days. As you move through the phases, you begin to add back healthy food and eating habits back into your diet. 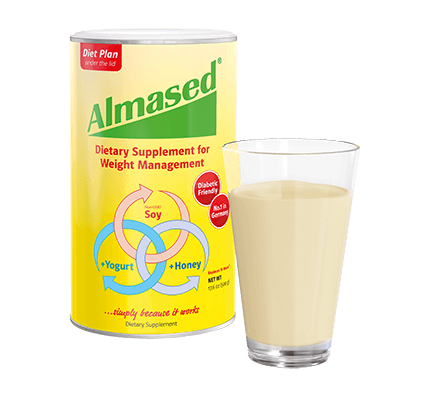 Almased shakes are convenient, a no-fuss way to satisfy hunger and lose weight. Simply mix 8 Tbsp of Almased with 10-12 oz of water and add your favorite spices or extracts. You can also try a variety of different recipes. Crystal's favorite is the Caramel Latte. 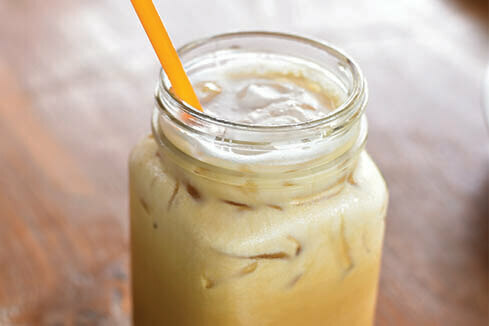 Blend 8 Tbsp Almased with 6 oz of plain almond milk with 4 oz of cold coffee and add 1 tsp of caramel extract. You may add Stevia to taste. "While facing many stressful factors in my life, such as divorce, I instantly went from 140 pounds to a whopping 210 pounds overnight. I eventually started seeking ways to improve my health and lifestyle. One day, I discovered Almased at a wellness center. At first I was skeptical since I had tried so many things up to that point, but still I was motivated to give Almased a try after the owner of the wellness center recommended it to me. Boy was I impressed! After the first week of following the Almased Diet and working out every other day, I was down 4 pounds. After week one, I noticed it helped me control my appetite which made me more conscious of what I was eating throughout the day. To make a long story short, the pounds began to continually disappear. I still use Almased and today, I am 135 pounds and healthy! I went from a size 16 to a size 6 in the course of a year and the weight has stayed off." I discovered Almased through a magazine. After months of wavering, I decided to give it a try. When I started, I used Almased based on how I felt since my goal was to cut out junk foods and sweets. For six months, I used Almased as part of a healthy diet and worked out reguarly. I didn’t pay much attention to the scale but more on how I felt and the way my body looked. One day I stepped on the scale and noticed not only weight loss, but also inches lost. I felt better and much lighter. I’m proud of the goals I’ve reached with Almased, my diet, and my workout program. The best thing about this all is that my son has witnessed this weight loss journey, the before and the now. He has a mom that he is proud of, a mom that kept going and reached her health goals. 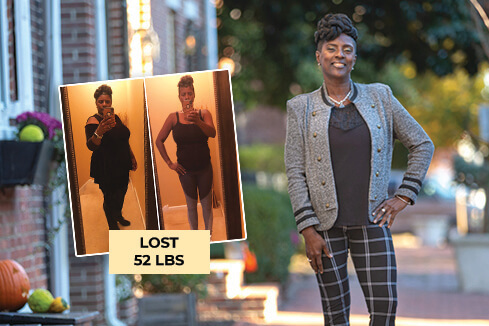 Almost 4 months after Crystal used Almased, she lost 52 lbs. Surprised by her transformation, Crystal's friends saw a whole new person. "My friends started asking me how I did it." Proudly Crystal tells her friends about Almased. "My doctor even told me that my lab work has significantly improved through the weight I lost." Now at her goal weight, Crystal continues to maintain her weight by eating healthy - sticking to lean proteins and veggies and no longer snacking on healthier foods - new eating habits that Almased Diet program teaches. "I feel healthier and have so much more energy. Now I love the way my clothes fit and how I look." Boost Your Metabolism with Almased! The exclusive, natural Almased formula provides the body with quality nutrition in one simple shake. You don’t have to worry about whether you are getting enough nutrients from the foods you eat or spend time calculating ingredients. It’s all right there in Almased. Use Almased with our easy-to-follow Figure Plan (PDF) to give your body the quick and noticeable results you want! We’re available to you for nutrition support and customer assistance. You can reach us directly by phone at 1-877-256-2733. Find Almased at your favorite retailers both online and in stores!